This yummy sounding recipe for apple crumb pie was originally submitted by Yittel from New York. Yittel has added several delicious recipes to the site, most of them quite healthy. This is fairly healthy too, with very little sugar. This is a variation of a Dutch apple pie, with a crumble top crust. The difference in this recipe is that you don’t have a bottom pie crust. Instead you have more delicious crumble. Mix together the flour, sugar, egg, vanilla sugar and oil. Put 1/2 of crumbs in a 9x13 pan, the rest leave in the bowl. Peel the apples, taking out pits, and cut into thin slices. When all 10 apples are sliced and ready in a bowl, sprinkle them with the cinnamon, 3 tablespoons of sugar, add a cap of lemon juice. Put the whole apple mix onto the crumbs mixture in the pan. With your hands, crumble the other half of the crumb mixture. Put them on top of the apples. Bake for 1 1/2 hours at 325ºF. Enjoy the great apple taste. You can add a half of a 16 ounce can of cherry pie filling on top of the apples before the top crumbs layer. If you don’t have Cortland apples, use your favorite cooking apples. I think the recipe tastes best if you use apples that soften when they are baked. Remember that not all apples are suitable for cooking. Delicious apples are one example. Other than Courtlands, McIntosh apples, Spy, Ida Red and Galas all bake well. If you have another apple that you want to use, just check that it is right for baking. 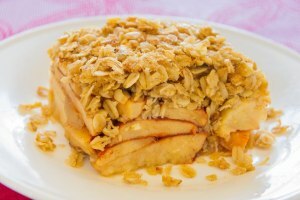 If you like this apple crumb pie recipe try our traditional apple pie. We think it’s the best. Amazing, easy and the best pie ever!